The weather is changing in north india. The morning and evening air has a slight chill indicating the approach of winters!!! As the days grow shorter and nights longer, it is a little challenging to convince my toddler to dress up in warmer clothes and use a blanket at night. OK, so lets move on with my post for the day. Did I ever mention than before being a mom and wife, I was a makeup admirer. Today if I think if there was no makeup in my life then it would be a very dull existence. 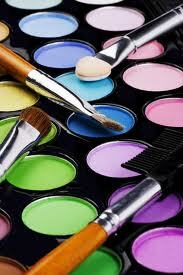 Makeup is not just my passion, its my favorite pastime and hobby. 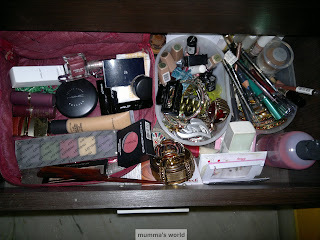 And boy am I thankful to all the cosmetics sitting inside my dressing table for keeping me from going insane as a working mother. The journey to being a makeup enthusiast is a very long one. Actually thinking, my first memory using makeup is can be described in one word "crazy". I was a kid around 6-7 years of age when I was caught by my mom using camel crayons on my eyelids as an eye shadow. Though i was caught by my mom and reprimanded for using them ever on my face again as they are posionous. For once I listened to my mom for which I am glad today. As a kid, I used to be fascinated by my aunt's makeup collection as my mom didn't use any cosmetic except a bindi (daily) and an additional maroon lipstick (for weddings). So, as a child I used to look forward to visit my relatives just to catch a glimpse of their makeup which included a foundation, some eye shadow and the same maroon lipstick as my mom's. Then came my first makeup items, nail polishes, though not allowed in school my mum got me some as a birthday present. The nail polishes were my constant companion throughout school and college. Later during my Ph.D. I was being drawn into the world of makeup and skincare again. This time with a bang!!! Even though my cosmetic usage was limited to gloss and kajal, I would love to ogle at the pics of made up faces of actors and actresses and dream to be one of them. My first gloss as well as kajal being lakme (the oh so popular indian cosmetic brand). Then came the biggest occasion in a girl's life: marriage. And all hell broke loose. Not literally though. For the first time I was to have my own makeup yipppppppeeeeeeeeee. I got cosmetics as gifts from my mom-in-law, my mom as well as relatives. I had the chance to use makeup which included foundation, compact, blush, eyeliner, eyeshadow, mascara, lipsticks and nail polishes. This was my stepping stone in the world of makeup. Most of the items were from lakme, revlon, and oriflame. But applying makeup to look flawless and fabulous is a different story. 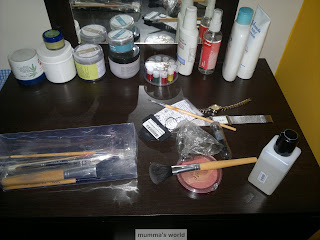 Slowly, I learnt makeup usage and gained information on new product launches. With the opening of MAC and Inglot makeup stores in India, I was being introduced to world-renowned makeup brands. This led to a never ending shopping haul / spree and finally I have a decent collection of cosmetics comprising: foundation, blush, eye shadow, mascara, eyeliner pencils, gel liners, makeup brushes, lip paints, lipsticks, perfumes, lip glosses, paint pots, compact powder... I guess I have covered most of the ones which I remember. Below are pics of a my makeup collection (highly unorganized). Enjoy the pics!! !